This accent chair is a little more casual and contemporary than the other items in its collection. It will assist you in creating a room that is classic, yet still looks fresh. It features rounded arms for a simple elegance with tapered wood legs. 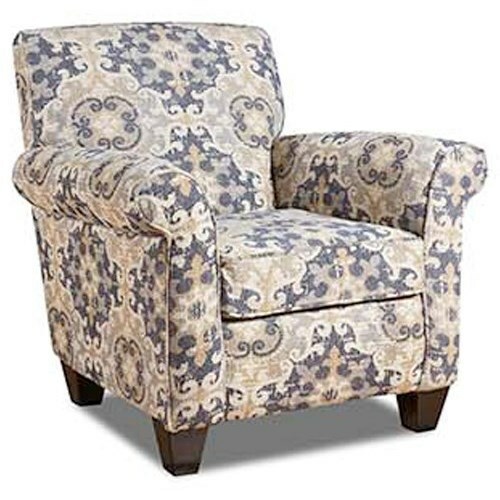 The 97C0 Accent Chair with Round Arms by Corinthian at Miskelly Furniture in the Jackson, Pearl, Madison, Ridgeland, Flowood Mississippi area. Product availability may vary. Contact us for the most current availability on this product. Leg or Skirt Exposed wood legs. Bun feet on sofa, sleeper, loveseat, chair and ottoman. Tapered feet on accent chair and ottoman. This traditional furniture group will help you to capture a high-end look in your living room display. Features like rolled arms are full of classic ambiance and give this collection just enough detail without going over-the-top. Choose this collection to create a fashionable room at an affordable price point. The 97C0 collection is a great option if you are looking for Casual furniture in the Jackson, Pearl, Madison, Ridgeland, Flowood Mississippi area. Browse other items in the 97C0 collection from Miskelly Furniture in the Jackson, Pearl, Madison, Ridgeland, Flowood Mississippi area.